So has the Obama Administration again lied to the American people, as they apparently did about the virtues of ObamaCare, misrepresenting the Iran nuclear deal as rescuing America and the world from the terrors of an Islamic Bomb? The situation for the American people, Israel and our other allies may be far more perilous than having a liar in the White House. We have survived great prevaricators before. Just as President Obama and his Administration genuinely believe in the virtues of ObamaCare, so too they probably genuinely believe in their nuclear deal with Iran, though both are dangerously misguided fantasies. Can we survive a White House and an Administration so ideological, so enamored of their own ideas, that they are blind to reality and rationalize all facts to fit their fantasy world? “Magical thinking may lead people to believe that their thoughts by themselves can bring about effects in the world or that thinking something corresponds to doing it,” according to a textbook on clinical psychology. Western democracies have a long history of indulging themselves in escapist fantasies when confronted with an existential threat. In 1910, Norman Angell’s theory that European economic interdependence had rendered war obsolete was widely believed, including by progressive elites in Britain, France, and the Benelux countries, who were nearly defeated by Imperial Germany at the outbreak of World War I. Over 16 million deaths in “the war to end all wars” belied the “no more war” fantasy. In 1938, British Prime Minister Neville Chamberlain’s promise that he had negotiated “Peace for Our Time” with Adolph Hitler contributed to the unpreparedness and near defeat of the Allies by Nazi Germany during World War II. Over 60 million died for Chamberlain’s fantasy. In 1994, President William Jefferson Clinton had his “Peace for Our Time” moment when he negotiated his Agreed Framework that would supposedly denuclearize North Korea. Pyongyang exploded this fantasy with a series of nuclear tests culminating in a credible threat to make nuclear missile strikes on South Korea, Japan, and the United States in March 2013. Today, the American people, Israel, Saudi Arabia and our other allies are asked to believe that, after making enormous sacrifices to develop nuclear weapons over a quarter-century, and being only months away from an Islamic Bomb–Iran has now surrendered. Economic sanctions have broken the Mullahs, or so the narrative goes. Western elites who calculate almost everything in terms of dollars and cents have no problem believing this fantasy. But the Mullahs have never cared much about dollars and cents, and have been willing to make far more terrible sacrifices than those imposed upon the Iranian people by sanctions. During the Iraq-Iran War (1980-1988), the Iranian Revolutionary Guard used children armed with nothing but the Koran to clear minefields and as human shields. Hundreds of thousands of Iranians were sacrificed against a technologically superior Iraqi Army that used poison gas to kill, blind and ulcerate casualties in numbers not seen since World War I. Would the Mullahs who sanctioned such sacrifices now buckle because they have a lousy rating in Standard and Poor’s? If sanctions have not broken the Mullahs, then what is happening? Maybe Iran already has the bomb. The United States during its Manhattan Project in World War II developed the first atomic bombs, using 1940s era technology, in only three years. Iran has the advantage of modern technology, copious unclassified information on nuclear weapons design, help from North Korea and others, and has been working on the bomb for 25 years. If Iran already has the bomb, then they can afford to slow or even stop enriching uranium and allow inspections at known facilities, because they now have nuclear weapons, and the capability to build more at secret facilities–just as happened in North Korea. Reza Kahlili, the only CIA operative to penetrate the scientific wing of the Iranian Revolutionary Guard, now a journalist, has reported that Iran has Russian tactical nuclear weapons and is building nuclear warheads. Kahlili, by the way, based on his sources inside Iran, reported months ago the Obama Administration’s secret nuclear negotiations with Tehran, that are today such a surprise to the mainstream media. Israeli scientists warned that Iran already has its Islamic Bomb in an article published in Maariv in September. Ignored by the mainstream press are statements that Iran might already have the bomb by Dr. William Graham (President Reagan’s Science Advisor), Fritz Ermarth (former Chairman of the National Intelligence Council), Vice Admiral Robert Monroe (former Director of the Defense Nuclear Agency), Ambassador Henry Cooper (former Director of the Strategic Defense Initiative) and others. 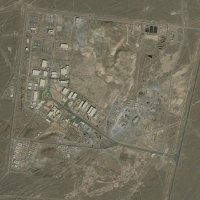 Readers might want to visit Kahlili’s website to see satellite imagery of Iran’s Quds (“Jerusalem”) underground facility, that is surrounded by missile launchers, and structures that look suspiciously like nuclear warhead storage casernes. The Mullahs too engage in magical thinking. The Mullahs dwell not in the world of money or in the sphere of geopolitics, but in the transcendental realm of religious eschatology. Nuclear electromagnetic pulse (EMP) attacks can collapse the critical infrastructures that sustain the West and exterminate the Infidels–slain by our very dependency on the false God technology as if by divine justice–thus paving the way for the return of the 12th Imam, and the worldwide triumph of Islam. The Congressional EMP Commission estimates that, given the Nation’s current unpreparedness, a nuclear EMP attack that blacks-out the electric grid and other critical infrastructures for a year could kill 9 of 10 Americans by starvation, disease and societal collapse. U.S. allies in Europe and Asia are similarly vulnerable. Russia and China, however, have hardened their critical infrastructures against EMP attack. Is it possible that Russia and China have not supported U.S. efforts to denuclearize Iran and North Korea because they want them to be nuclear weapon states, perhaps to wage nuclear war by proxy for Moscow or Beijing, should this ever become necessary? This is precisely how we arrived at a nuclear armed North Korea. President Obama still cannot bring himself to acknowledge the reality that North Korea is a nuclear weapons state, despite assessments by his own Defense Intelligence Agency and others that North Korea has nuclear missiles. Washington can talk all it wants, but the Mullahs will not give up the bomb just because sanctions have made the Rial worthless. The theocracy that celebrates the use of children as suicide bombers has a calling and a mission beyond this Earth that the Mullahs will never betray by surrendering their duty to redeem the world by Nuclear Jihad.